Indulge me one last time (for awhile anyway) in my love of jackfruit? Because these Hawaiian Jackfruit Pineapple Kebabs were so incredibly tasty! So far, we’ve made a Vegan Teryaki Jackfruit Bowl, Jackfruit Flautas with Sweet Corn Sauce, Vegan Pulled Jackfruit Sandwiches (with traditional BBQ sauce), Kentucky Fried Jackfruit, use it in my Vegan Nicoise Salad, Homemade Jackfruit Tortilla Soup and most recently, Pulled Jackfruit with Alabama White Barbecue Sauce. 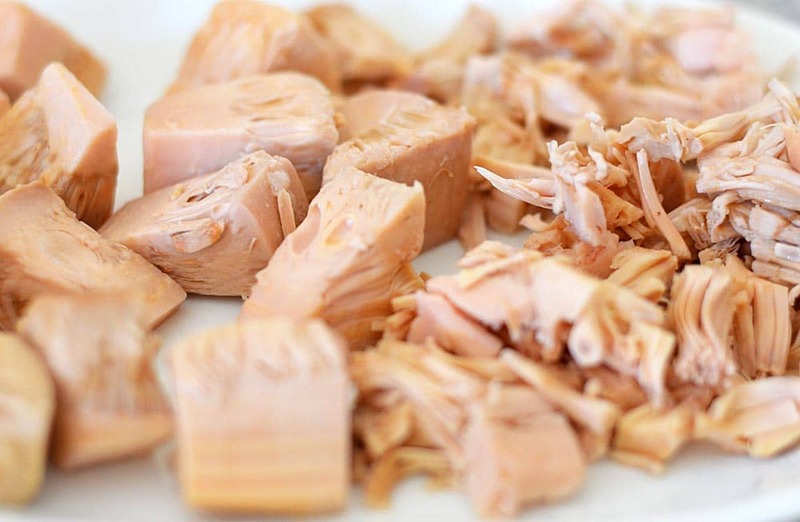 I have heard from a number of readers that they are unable to find the canned jackfruit locally, so I’ve compiled a few good options available from Amazon. The one pictured is from Native Forest. That being said, it is packed in a salty brine and I am finding myself more prone to direct you to the ones packed in water. Trader Joes, Whole Foods, etc. all carry these products. Just avoid those that are packed in a sweet syrup. 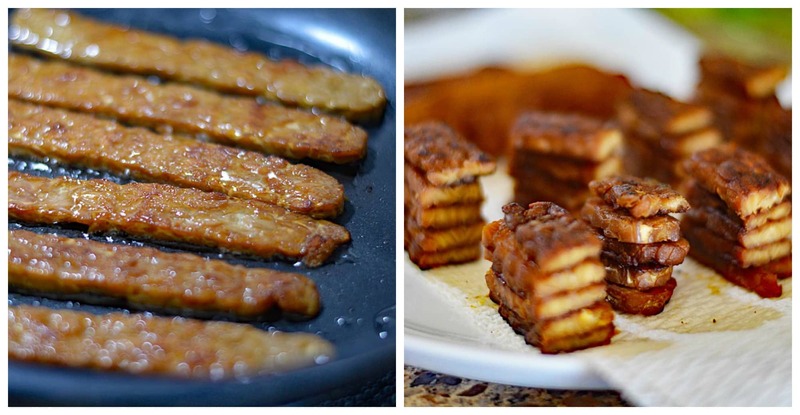 I got a little creative and used maple-flavored tempeh bacon (it’s growing on me). But because it’s so thin, I decided to stack them and cut into 1″ pieces. These need to be pre-cooked in a saute pan with a bit of oil. They caramelize and firm up enough for skewering. 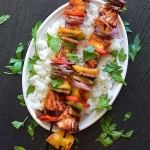 I mentioned in my post for Pulled Jackfruit with Alabama White Barbecue Sauce that after draining and rinsing the can of jackfruit, I sort through to find the most sturdy pieces for these kebabs. I reserve the rest for a pulled jackfruit recipe. There is no real rhyme or reason to how I layered these kebabs. 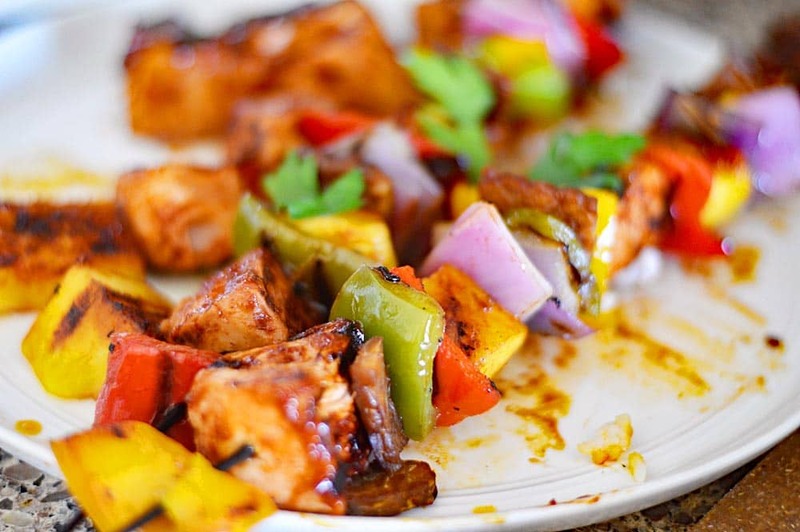 Just alternate red, green and yellow peppers, red onions, the tempeh bacon, pineapple pieces and of course, our jackfruit pieces that you have tossed or brushed with barbecue sauce. I just use my favorite bottled sauce. You can use an outdoor grill (or a grill pan on the stove if you don’t have one). Either way, be sure you oil the grates well because we don’t want things to stick. If you prefer your veggies a bit more tender, feel free to roast the cut pieces in a tin pan on the grill before threading on the skewers. 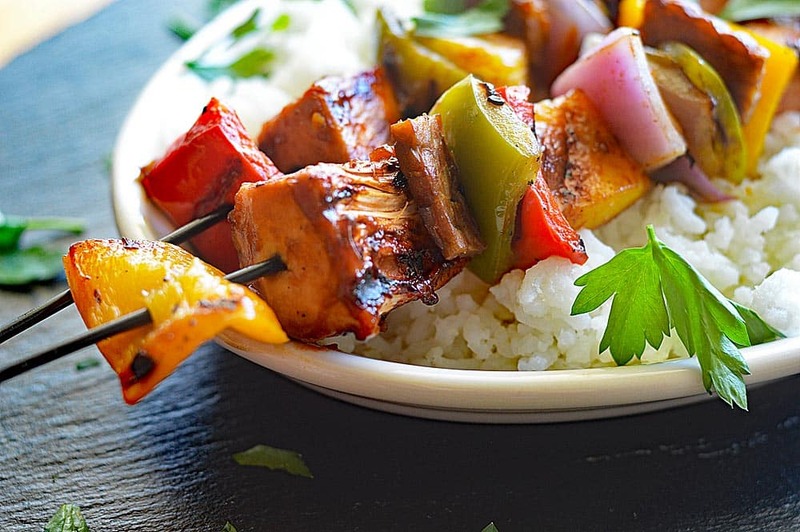 I like to serve my kebabs over white rice with a bit more of the barbecue sauce. 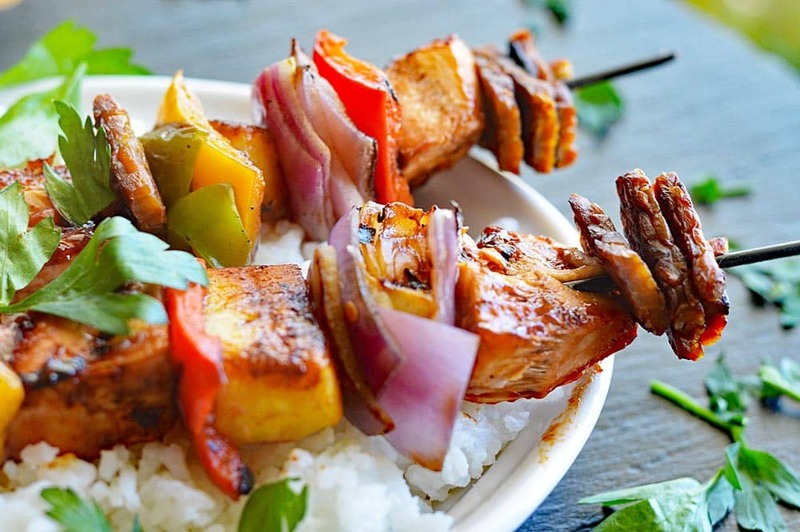 Did you make this recipe for Hawaiian Jackfruit Pineapple Kebabs? Let me know in the comments section below. *Some of the links on this page are affiliate links. Clicking on them does not affect your purchase price, it just means we get a very small percentage that assists in keeping The Veg Life! creating new recipes for you each week. Prep the white rice according package instructions. In a large saute pan over medium high heat, add 1 tsp of oil and the tempeh bacon. Cut into 1" pieces. While the tempeh bacon is cooking, cut all of the veggies and pineapple into 1" pieces. If you like your veggies a bit more cooked, you can roast them in a tin foil pan on the grill or in a saute pan for a few minutes before assembly. Assemble your skewers, stacking the bacon pieces. I like to toss the jackfruit with BBQ sauce. You can brush with more on the grill. Brush the grill (or grill pan if doing indoors) with enough oil so they won't stick. 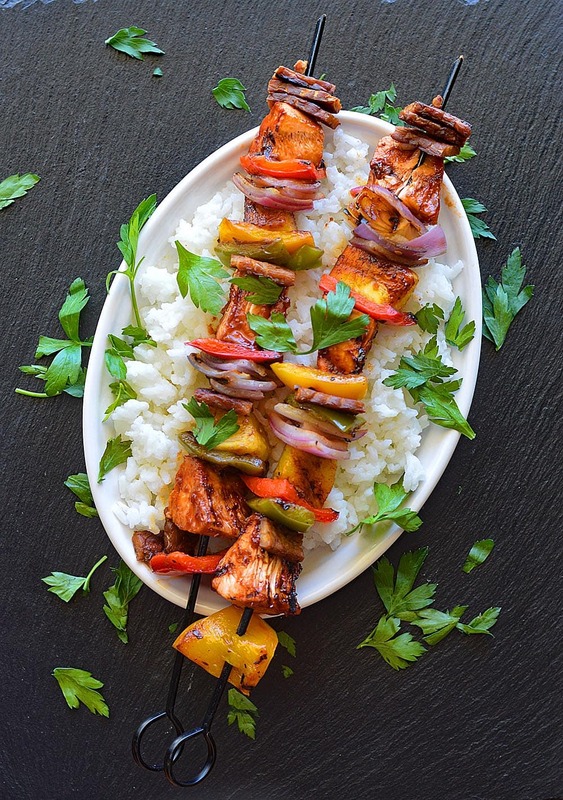 Grill until veggies are tender and everything on the skewer has grill marks. Try to turn only once halfway through. Serve over cooked white rice and with additional barbecue sauce. Garnish with fresh parsley. I’m going to have to check out these jackfruit recipes! I haven’t tried it before, but your recipes look great. I haven’t gone looking for canned jackfruit specifically, but my closest grocery store that has a bunch of Southeast Asian food carries other products from Aroy-D, Chaokoh, and… whatever that blue labeled one is, so if you have a SE Asian grocer nearby, try them. Looking at the photos on the label, I think I just saw whole jackfruit there, too!